This is a perfect Valentine Card for your kids to hand out at their classroom party. With a few simple supplies and candy buttons you can make a Valentine Card cell phone. Kids always get so excited to hand out their card to all their friends. This is a perfect way to spend the afternoon with your kids being crafty. With a few simple supplies and depending on how many card you will be making about an hour to hour and a half of you time your can create this cute cell phone cards. All supplies can all be bought at your local craft store. 1. Cut a rectangle from silver card stock approx. size should be 2 1/2" by 7"
3. Round off the corners - If you are into scrap booking you can use a corner punch, it works great. 4. Using the white paper you are going to want to make two message screens. One smaller one for the front of your phone and one large one for the inside of your phone. 5. Using your silver card stock cut a strip to make an antenna. 6. Cut your candy buttons to fit inside the card for the keypad. Once you have all your pieces cut out you are ready to assemble. We recommend using the scrapbook adhesives when attaching the candy buttons, as you don't want the glue to soak through. You child will be the hit of the party with these cute cards. These are perfect to make in a group, however we do recommend if making with smaller children to have all your pieces cute out ahead of time and ready to assemble. Older kids especially those over 10 do fine making the whole card. Some of the messages that can be written on the screen could be call me, be mine, be my Valentine, let your child be creative and have fun. Valentine's day is one of the most popular holidays for candy gift giving. Many candy companies have come out with a version of old time candy for the holidays. 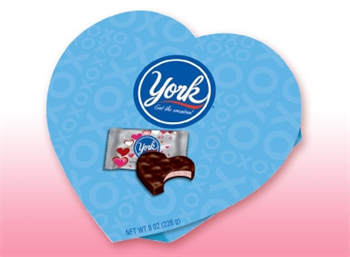 One of most popular Valentine candy this year is the York Heart Shaped Peppermint Patties. You get the same great peppermint patties with the dark chocolate covering the cool minty center, however these are shaped like hearts and have a pink mint center. We have to different heart shaped patties to choose from. You can get a heart shaped box filled with the peppermint patty hearts. Each box has 18 hearts inside of blue heart gift box. These are perfect to give to that someone special in your life. These are the perfect Valentine candy to have shipped to your valentine and let them know you are thinking of them, they are already in a gift box so no wrapping is needed. We can even add a personalized gift message if you would like. The heart shaped patties are also available in a bag. These are perfect to hand out at classroom parties, to put on your desk to share or for those of you who love peppermint patties these are perfect just to eat. I don't know why but for some reason these heart shaped candies seem to taste so much better then just plain peppermint patties. Each bag has 24 individually wrapped treats. You can buy all your favorite Valentine Candy at O'Ryans Village. From chocolates, heart shaped gummy candy, heart shaped suckers or Brach's Valentine Candy. We have many great choices to let that someone special know you are sweet on them.